Arguably the best husband and wife team to hit the Canadian Lawn Bowls scene has done it again. Last year’s B.C. 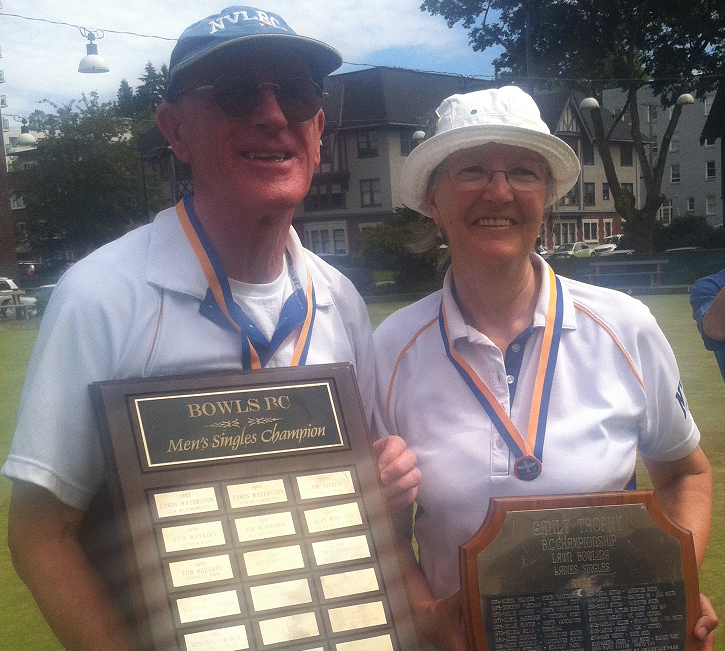 and National Mixed Pairs Champions Malcolm and Marie Taylor scooped the 2014 Provincial Outdoor Singles titles going undefeated throughout the double knockout tournaments. On the final day, June 8, there were five tiebreaker games. The Men’s final ending after two tied sets and the 3-end tiebreaker. The only game that didn’t finish in a tiebreak was the Women’s bronze medal match which had a tied first set. Picking up the silver medals were Gary Kirk and Pricilla Westlake. Westlake defeated Margo Li in the first draw of the day where Li was awarded the bronze medal. The Men’s bronze medal game between Eric Leung and Stanley Chow had Leung coming out on top. The Taylor’s will bowl at Commonwealth LBC in Edmonton wearing the gold and blue for B.C. June 18-25 at the National Singles Championship.